July 2nd 2009 | NEW YORK. Image by Corbis. AS AMERICA celebrates its birthday on July 4th, New York is celebrating the discovery of its Hudson river. 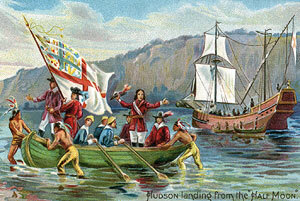 The Dutch East India Company hired Henry Hudson, an English explorer, to find a north-west passage to Asia. He failed: the route defied all explorers until Roald Amundsen in 1906. But Hudson’s journey of 1609 up the river that would later bear his name led to a valuable trade in furs and eventually to settlement by the Dutch. His shipmate recorded abundant fish and that the surrounding lands “were as pleasant with Grasse and Flowers, and goodly Trees, as euer they had seene, and very sweet smells came from them.” The smells unfortunately, have not always been so sweet. The Hudson has been exploited and abused. Factories used the river as a dumping-ground. At one time a 20-mile stretch of the Hudson had little or no aquatic life. “You could tell what colour the GM plant in Sleepy Hollow was painting its cars by the colour of the water,” recalls Alex Matthiessen, president of Riverkeeper, an environmental watchdog. Since the 1960s, groups like Riverkeeper and advocates such as Pete Seeger, a folk singer, have fought to restore the river’s ecosystem. The 1972 Clean Water Act helped deter polluters. And in 1984 the federal Environmental Protection Agency classified 200 miles of the river as a Superfund site, eligible for special attention. As a result of all this the river has begun to look like its old self. Water quality has improved. Some fish populations look healthier. The Bald Eagle once again nests nearby. There are still concerns. Indian Point, a nuclear power plant in Westchester, uses up to 2.5 billion gallons (9.5 billion litres) of river water a day. The water is then discharged back into the Hudson. According to Riverkeeper, the hotter discharged water kills large numbers of fish, larvae and eggs. Indian Point says there have been no temperature-related deaths. There is also considerable contamination by PCBs, toxic chemicals with carcinogenic effects. After years of delays General Electric has now begun a process of dredging to clean up the contaminants. But it was already safe to swim with the fishes, except after heavy rain. Antiquated sewage systems in New York City and in towns and cities further up river cannot handle storm surges. The Netherlands still retains an interest in its former New Amsterdam. The country is America’s fourth largest investor. It is participating in many of the festivities, including a big flotilla last month. New York’s July 4th fireworks display is taking place on the Hudson. In September a replica of Hudson’s ship, the Half Moon, will re-enact the captain’s journey. But he wasn’t the first to discover the river, of course. Native tribes lived along the “Mahicantuck” for thousands of years.